GIFs Now on Facebook – GIF up your Timeline !!! GIFs have somewhat officially made their way to Facebook, the web’s favorite animation form returned to Facebook on Thursday, thanks to GIF search engine Giphy. Here’s How To Post GIFs On Facebook ? If you want to share a GIF on Facebook, first head on over to Giphy. 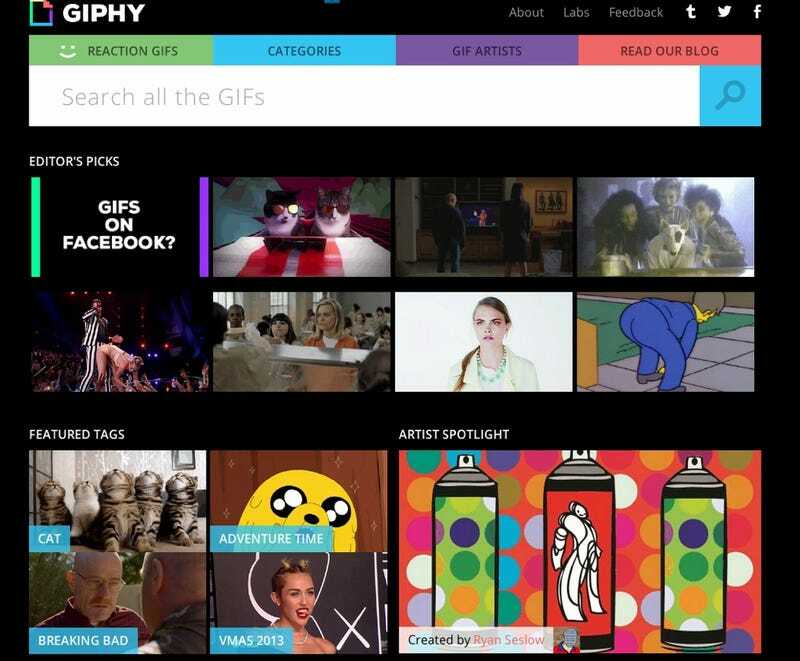 Giphy allows you to search through all the GIFs that creators have uploaded to the site. Once you find a GIF you want to share, click the Facebook icon below the animation. I decided to share it on my Timeline. Click the play icon to see the GIF. Facebook hasn’t been a very GIF-friendly part of the Web. It’s still not. But a third-party Flash workaround lets you incorporate these animated gems into your timeline anyway. The fine folks over at the Betaworks-owned Giphy have given us what Facebook has yet to implement natively: embedded GIFs that play in your timeline. Well, not exactly GIFs. Giphy actually creates a Flash video that it embeds in your timeline. Still, it’s pretty cool. Just search for a GIF on Giphy, and when you find the 10-20 frames that really nail how you feel, click on the share to Facebook button. If you’re thinking this will mean that officially-sanctioned native GIFs are coming from Facebook, don’t hold your breath. Facebook issued a statement about Giphy’s “GIF” embedding work-around: “Facebook does not support animated GIFs.” Will GIFs overtake Facebook the way they have Tumblr? Probably not to as a great of a degree. The embed format isn’t optimal: GIFs don’t autoplay, so they function more like short videos. New York subway shutdown due to kittens !